In February, I learned the necessity of insurance, family, cash-in-your-pocket and good-quality plumbing. My house flooded – and I’m talking spectacular water-from-the-ceiling, I-hope-this-never-happens-to-a-house-I-own flood. Every room in my house received flood damage. We moved out for a month and the landlord gave us a new house (ok, his insurance did). I will say this: we got lucky and it could have been worse. I saved our expensive things from harm, my landlord had insurance. This could have gone worse. I count my blessings. The Tool Primer for Painting a Room after the jump! 1) Choose your paint. I’m pretty sure paint comes in three types: cheap, expensive and why-so-much expensive. I’ve found that the more expensive a paint is, the less time I spend painting. Expensive paint equals thick paint, so I suggest you buy as expensive as you can. Cheap paints can achieve great results but make up the financial difference in hours worked. 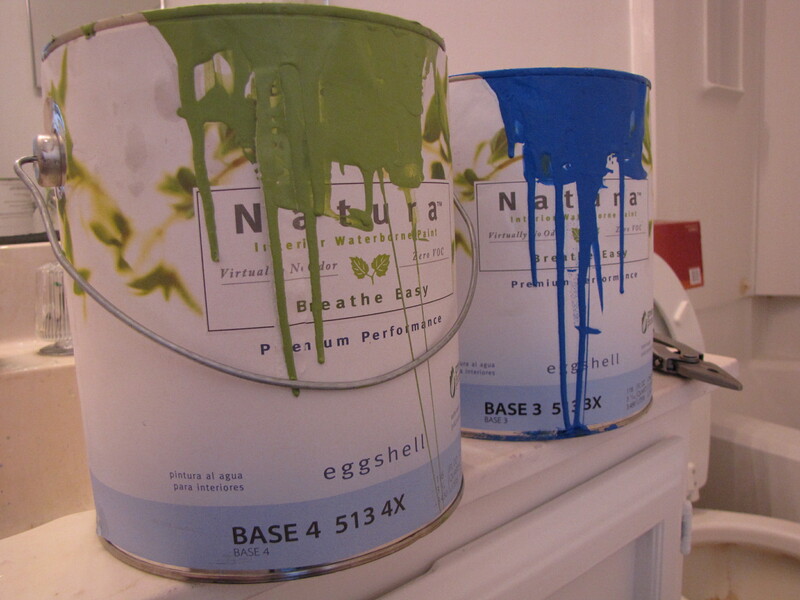 House paint usually comes in oil and latex varieties. I get the impression oil lasts longer, but it’s a pain for a non-pro to work with, needs lots of chemicals to clean up and makes a house unlivable until it cures (24 hrs). Latex washes in water, thins in water, wipes away in water, doesn’t cause skin allergies (in most people) and doesn’t smell as much (think 6 – 12 hrs instead). It also dries fast, within 4 hrs in the Texas heat. Use latex! And quit giggling. 1) Preparation, preparation, preparation. Tape a dropcloth to the baseboards, like so. Notice I taped the dropcloth to the baseboard. You don’t want little paint spots near your baseboards. 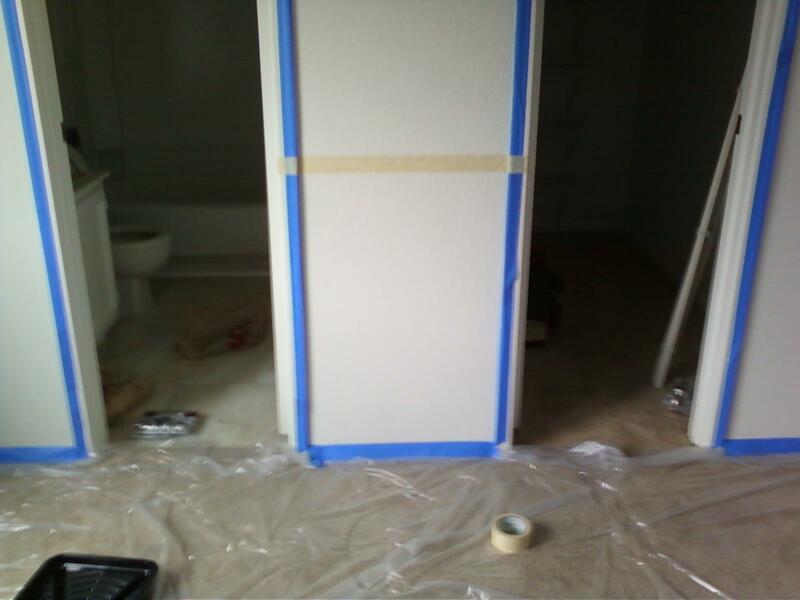 Remove wallpaper, tape & spackle joints and holes. 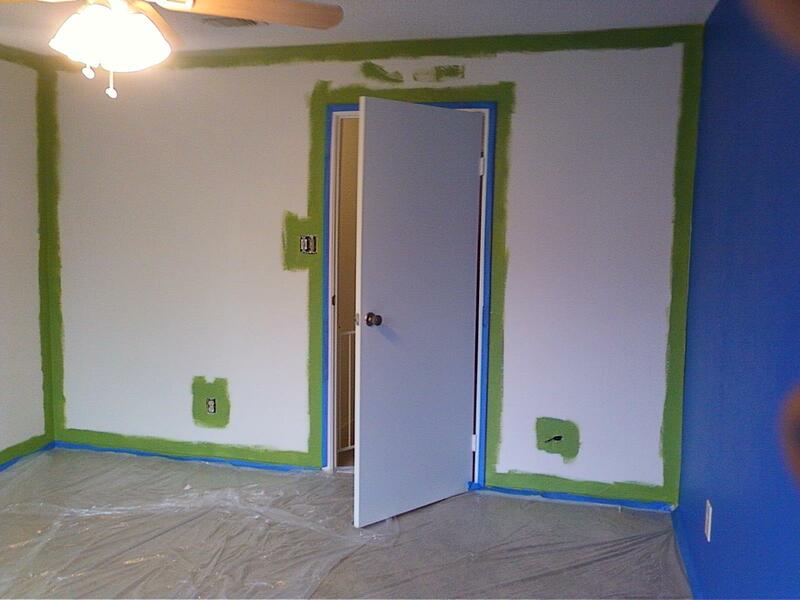 Sand your wall smooth, feathering the edges of the spackling into bare drywall. If you find you’ve sanded your wall “as smooth as possible” or you find yourself cursing “well, nobody’s gonna look at that corner anyways”, consider quitting while you are ahead and hiring a contractor. I’m not trying to be a jerk – but imperfections in your drywall/wall at the sanding/prep stage cannot be undone or hidden easily. 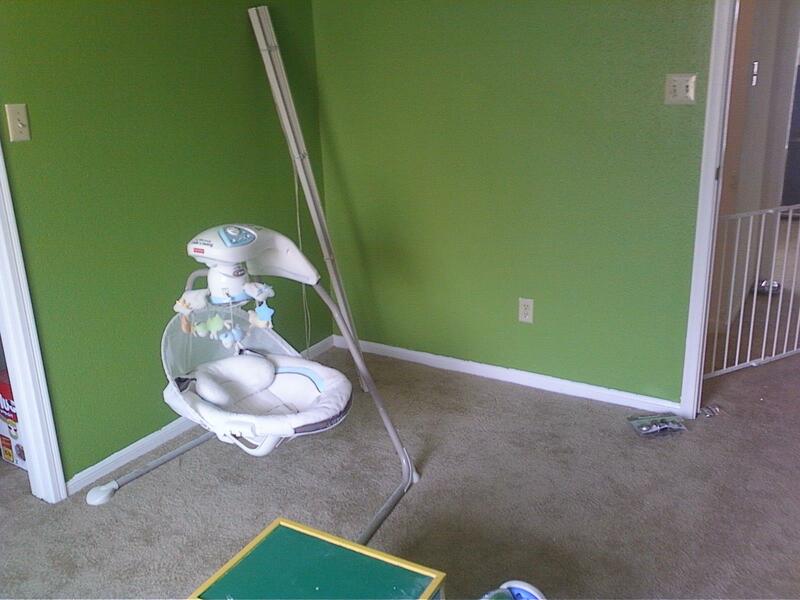 Hiring a good drywall wo/man will improve the paint job and your room’s attractiveness immeasurably. If you can or have to live with an imperfection (i.e. my wife living with me as a husband), go slow and practice patience. 2) More Preparation. Throw that used drop cloth away. Get a new one. Tape it down. 3) Even More Prep. Prime twice if you can. Primer, for those that don’t know, is a specialized paint which sticks to nearly anything and hides things like waters stains from walls. I’ve used cheap (read: no brand) primer, Kilz, Valspar and the eco-friendly stuff before and I can tell qualitative difference between the cheap stuff and everything else. Cheap paint has less pigment/whatever-ingredient-makes-the-color and therefore takes more coats to cover well. Medium-priced stuff and expensive stuff work the same, but differ in amount of smell. Time is money, and time with my kids is way more precious than painting a room. I got choo-choos to push around a track. Most primers smell. Bad. Oil-based primers will send you into a cigarette-and-dollar-beer bar for some fresh air, conventional latex primers will cause some discomfort for most people and the really expensive, no-VOC (volatile organic compound), eco-friendly latex primers have very little smell. Open a window, close the room’s door, let the room air out for an hour or so and the already light smell is gone. The no-VOC, eco-friendly latex primer and paints are worth the money. Splurge if you can. If you can’t, save some some dough until you can. I used Benjiman Moore’s Natura line found at ACE Hardware and loved it. If you skip this step, your paint will peel. If your paint already peels, someone did not primer very well or the surface has been damaged (usually water seeping under the paint). I will not skip this step again! 2) When using two tones, use the lightest first. 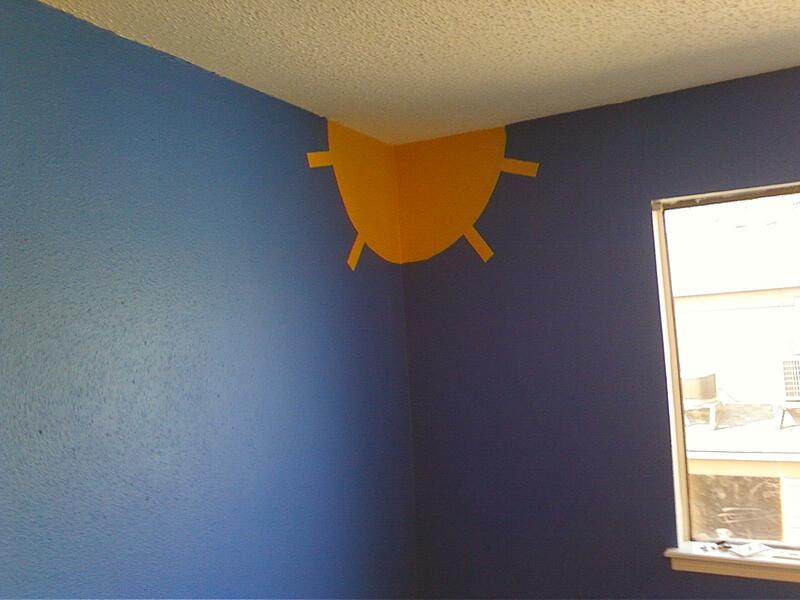 I made a sun in one corner of the room. Paint the yellow first, then the darker color. Yellow takes at least two coats to cover a pencil mark. It will never cover a darker color. Light before dark gives you a fighting chance of getting a crisp line between tones. But if your so-fancy-I-saw-it-on-the-Karadshian’s wall treatment requires some other set of directions, by all means follow those. 3) Mix paint. Because the paint will get thicker if you stir it. Don’t laugh all you painting veterans! Rookie mistake! 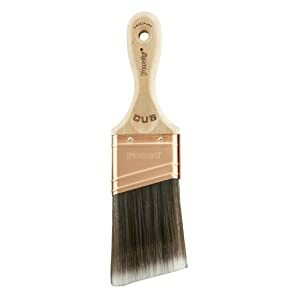 Otherwise, for the rest of use latex-based painters, we will get this brush. No really. Get this brush. This little Cub brush kicks donkeys. Again, it’s expensive compared to the cheap stuff. It works very well, well enough that I noticed a difference. The small handle means great control for adults and better control for kids (I didn’t forget my students in this tool evaluation). The bristles hold paint well and the paint flows out like water from a dam: controlled. It cleans impeccably. Get this brush. Also, use long strokes and be careful. [Insert joke here], it will take less time and look more professional. 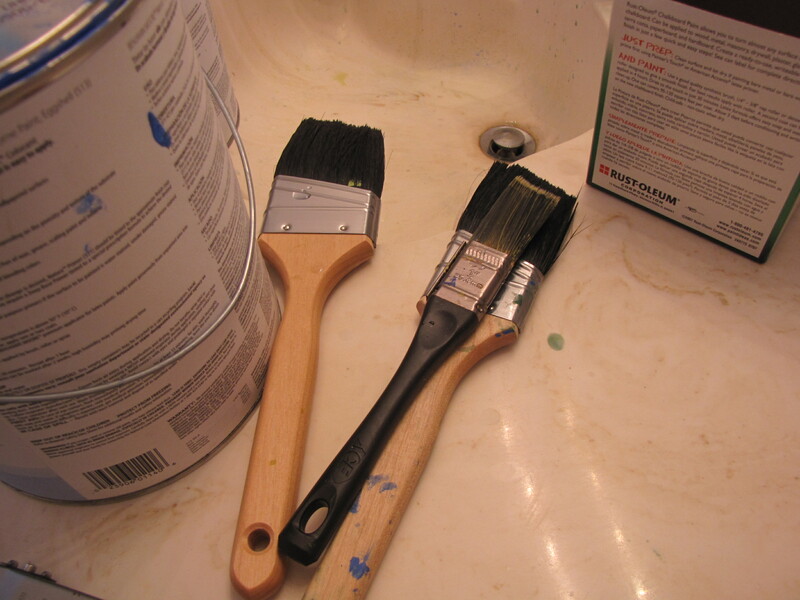 Cleaning up paint from areas which should not be painted (i.e door jambs) stinks. So avoid screw ups in this step if you can. Cutting In. trans v. The Process of Painting Around Doors, Sockets, Ceilings, Baseboards and any-other-such-stuff in order to create a clean, professional look. 5) Paint using a roller for the big portions, go up and down and stuff and be careful. 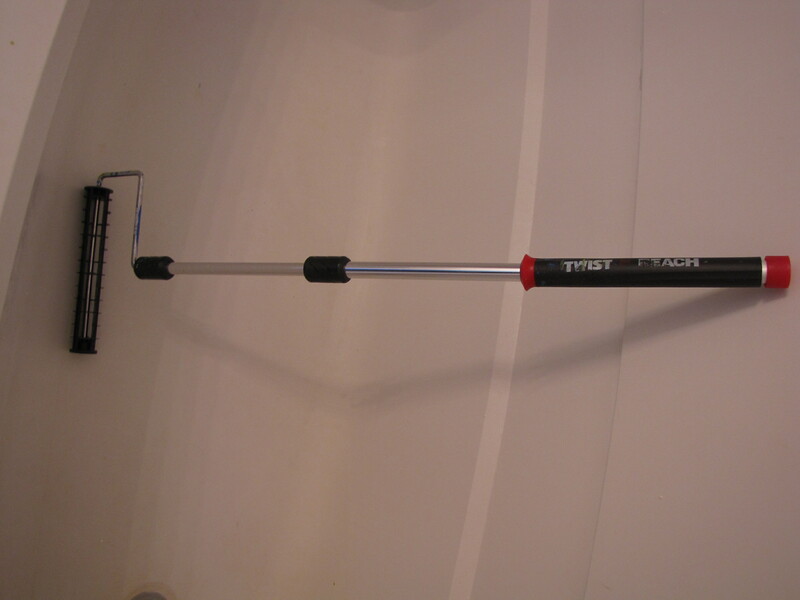 I used cheap(ish) rollers (one color per roller), and this expandable handle. The handle worked well, so did the rollers. You could buy expensive rollers (more paint equals more coverage equals maybe less time), you could rent or buy a sprayer, you could use that funny W pattern like in the Lowe’s commercial. I have no idea how that will work out for you. Maybe it makes great results, maybe it doesn’t matter. I will say this: I think Tip #6 matters most. 6) Use two coats. After years of sub-par results, I no longer mess around with Tip #6. Make sure you have the time and supplies to paint two coats of primer and two coats of paint. If you don’t, buy cheaper paint and invest hours instead of dollars into the job. 7) Clean up. If you want to re-use a roller, wrap the wet roller up in saran wrap and seal it from the air. No air means wet paint in the morning, even in 100 degree heat. I suggest using or making a paint comb. Both latex and oil brushes clean faster and clearer when I use a paint comb on them. Whew…I hope this helped somebody. It’ll just be thirteen-hundred words of self-talk therapy if I didn’t get someone to smile. Make it safe and keep the rubber side down. I like the extra work to make the room interesting.